Quality, energy efficiency, safety, and security are priorities with Hale Pet Door. Their dog doors are rated highest for insulation and sealing as well as protecting against wind, dust and insects. Hale makes custom sizes to meet all needs. 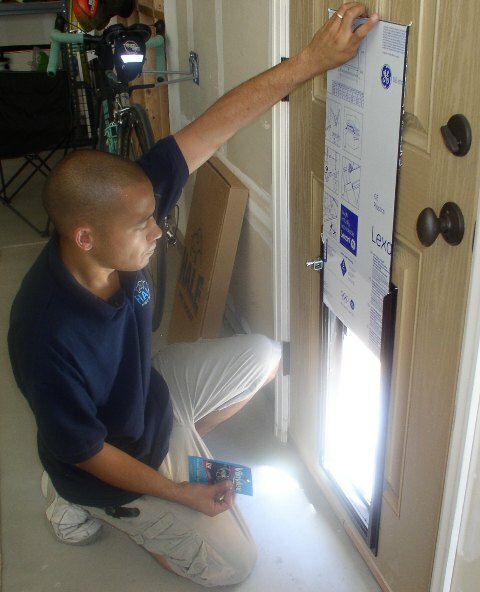 Step 1 Before installation, ensure that you have the proper size pet door for your cat or dog. If in doubt, it may be better to choose a larger size. It can be dangerous for your pet to use a too small pet door. A general rule is to install the pet door so that the height of the flap is at least as height as the top of your pet at the withers. If you have a short pet as well, be sure he won’t have too high a ‘step-over’. 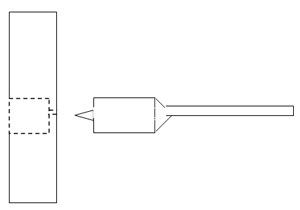 Step 2 Review the large illustration of the pet door at the end of the instructions and familiarize yourself with the various components. Step 3 Be sure you received all parts that should have been included. The tools required may differ depending upon the type of door you are installing in. You will need a drill to start the rough cut out and also to drill the screw holes, A saw will be required to finish cutting out the rough opening and a phillips head screwdriver for the screws. Step 4 Decide where to place your pet door. A good idea is to make sure that there are no knobs or other obstructions above the pet door that could interfere with the security cover. Step 5 Use drop cloths on both sides of the door to ease cleanup. Step 6 Mary the installation area using a level for accuracy. Use masking tape to record the placement before drilling. Measure and mark all four sides before sawing. Use masking tape to mark the rectangle. 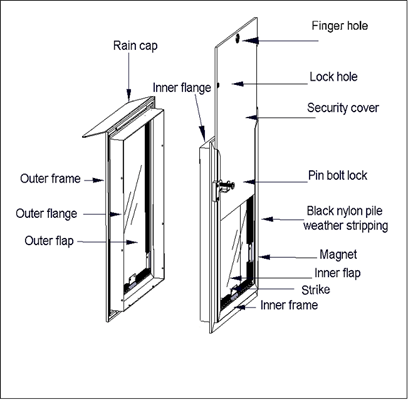 Use the following dimensions to get the correct size rough opening for your size door. Make sure the opening is square and level before drilling. This will help ensure that the pet door operates correctly. Step 7 For Wood Doors Drill out two corners diagonal from each other (top left and bottom right OR top right and bottom left). using a 7/8” wood bit or a 5/16” steel bit. If you use the 5/16” drill bit, drill three holes close together and wiggle the bit until you have connected the three holes. This procedure will allow you enough room to fit a jig saw blade into the holes. Drill your initial holes carefully and take care not to go outside your marked opening. You may wish to use a level on the drill bit to make sure that both the inside and outside edges of the rough opening are correctly aligned. After the holes are connected, use a reciprocating saw, scroll saw or jig saw to cut out the opening along the lines you’ve marked. Step 7 for Metal Doors If you have a drill and reciprocating saw, follow the above directions for wood doors, using a 14 tooth / inch blade on the reciprocating saw. Otherwise, drill the four corners and use a chisel at the corners to start the hole. Finish the rough opening cut with a power saber saw. Be careful that the saw blade does not dent the other side of the door while you cut. 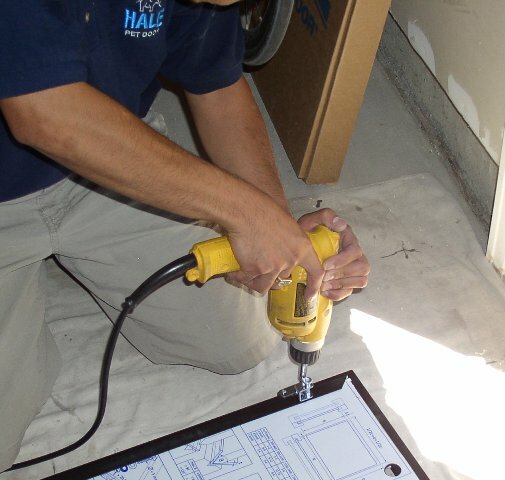 The Hale Pet Door™ “door” model is completely self-framing so there is no need to ‘frame out’ the inside of the door. Step 8 Separate the pet door frame into two halves and place the side with the locking cover to the inside. Remove the locking cover. 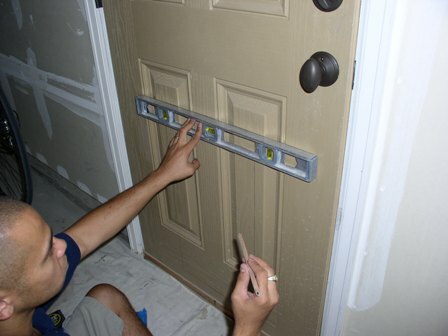 Before installing the pet door into the rough opening, loosen the screws holding the deadbolt lock. Back them out a few turns, otherwise they may protrude enough to keep the corner of the pet door off the people door leaving a gap. Step 9 Place the inside frame of the pet door into the opening in the door. 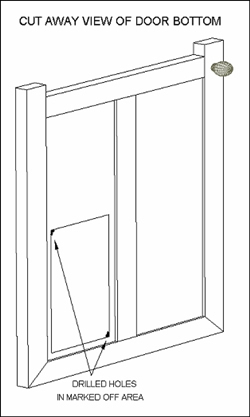 Place the outside frame of the pet door into the other side of the door and let the pet door frame telescope together. Squeeze the two sides of the pet doors frame together tightly. You may hold them together with carpenter’s clamps as you proceed. 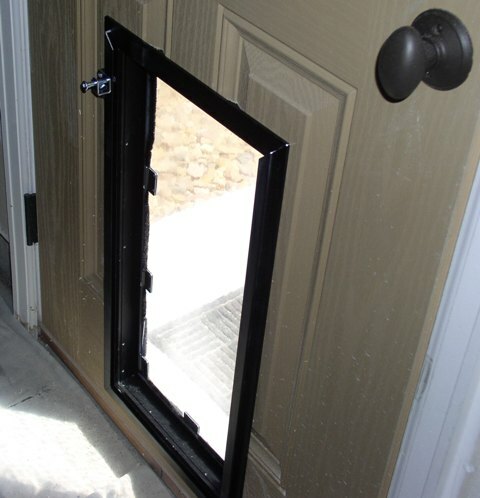 Optional Step If you elected to use the rain cap for your petdoor installation, attach it to the outer frame as shown. It will simply hook onto the top of the outer frame. Then telescope the frames together as stated in Step 9. Step 10 Using the pre-drilled pilot holes in the pet door frame and the supplied drill bit, drill one hole through the inside edge of the outside frame at the bottom. Insert and loosely tighten one screw. Make sure the door is level and adjust if needed. 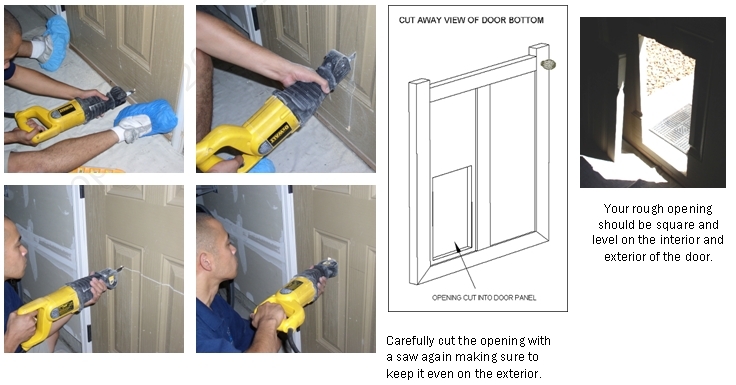 When door is level, tighten the inserted screw and repeat drilling and inserting the rest of the screws in the pet door frame. Also, retighten the screws that hold the pin bolt lock in place. Step 11 Once the pet door is installed you can fill any gaps or seal the edges with caulking if desired. Do not caulk the bottom of the inside or outside frame. It is a good idea to place blue painter’s tape around the three sides of the pet door that you will be caulking. After you apply the caulking and smooth it, you can remove the tape for a clean edge and no mess on your people door. See the instructions under “raised panel doors” for dealing with gaps and using caulking backer rod. Step 13: Remove the drop cloths and clean up the area. We recommend cleaning the frame and flaps of the pet door also. Use soap and water or glass cleaner without ammonia. You may also adjust the magnets in the frame if necessary. They can either be raised or lowered so the flaps seal but swing freely. 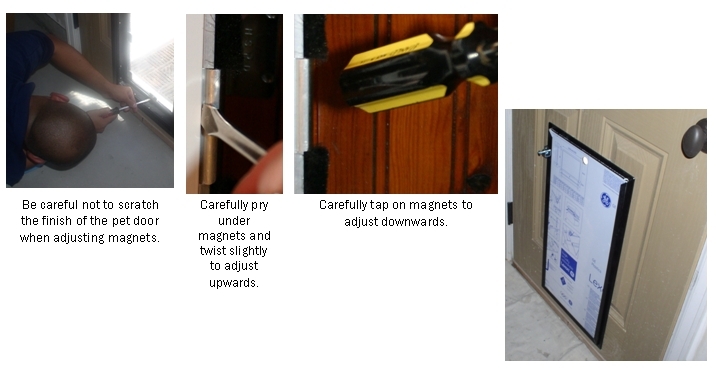 Adjust the magnets upward by twisting a flat headed screwdriver below the magnet between the magnet and the frame. Adjust the magnets downward by tapping lightly with the handle of your screwdriver. NEVER hit a magnet hard with a hammer as this may bend the legs of the magnet and cause it to eventually fall out of the door track. 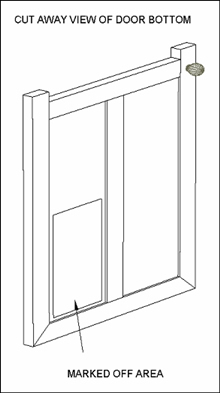 Two types of raised panel door are illustrated above. A true raised panel door will be built of solid wood, and the panels will be separate pieces of wood contained in the body of the door. This type of door is common on older homes, but in newer homes you are more likely to find doors whose surfaces have been molded to look like a raised panel door. Carefully consider placement of your pet door before cutting the rough opening. Ideally, the pet door should be either centered on the door or centered on a panel. If the door is a true raised panel door, centering the pet door on the people door is not a good idea. Cutting out the vertical support will structurally weaken the door. Once you have determined where to place the door, cut out the rough opening and install the pet door as described above. There should be gaps that need to be filled between the pet door and the door where the grooves from the raised panel are. Put blue masking tape on the door so that the bottom of the tape is even with the top of the pet door. Fill the gaps with “caulking backer rod”. Make sure your filler does not come up to the edge of the pet door frame. Fill the gap with caulk of an appropriate type and color. Smooth the caulk with a putty knife or a razor blade. Remove the blue tape carefully. Clean up and you are finished. 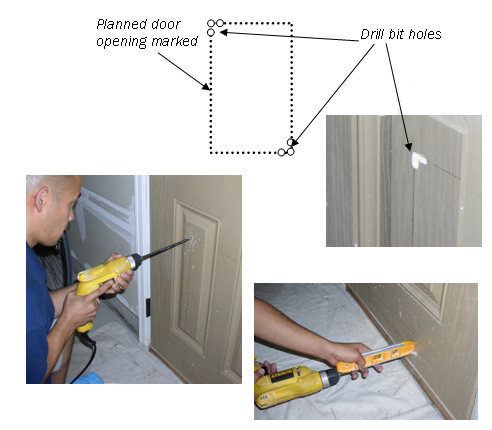 Typical crosshatch door To drill starter holes through a solid wood door, use a 7/8″ paddle bit and drill almost all the way through the door. Go to the other side of the door and finish the hole. This will prevent splintering wood. 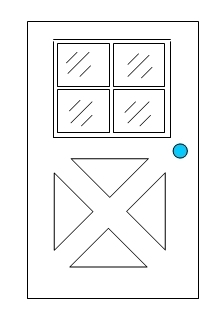 A crosshatch door, also called a farmhouse door, usually has a window in the upper half. The lower half is constructed very much like a raised panel door, but the panels are usually sunken in compared to the rest of the door. These doors are almost always solid wood. Be very careful when drilling your starter holes in wood. If you push too hard the wood may splinter. 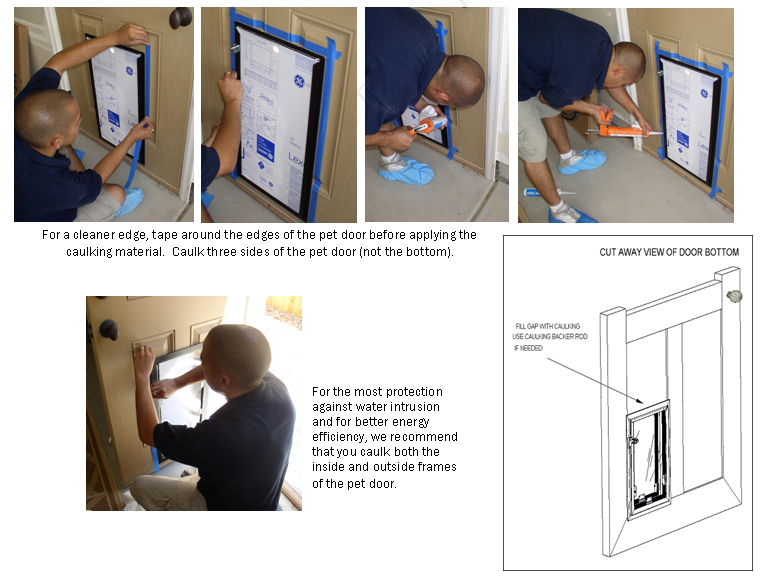 Installation of the pet door is about the same as with any other door. The difficulty is filling in the gaps. Depending on how deep the gap is, there are several different ways to approach this. If the gap is not very deep, caulking backer rod and caulk will work nicely. If the gap is deep you may want to consider filling with pieces of wood. This will require a hacksaw, miter box, and careful measuring. If you are installing in a hollow core door, don’t cut your rough opening with a reciprocating saw if you can avoid it. It tends to shake the door surface violently, sometimes separating it from the interior “honeycomb”. Use a circular saw and diamond blade. It makes a clean, easy cut. Fiberglass doors can be cut with a reciprocating saw or a circular saw with a diamond blade but be sure to wear a good dust mask! You do not want to be inhaling fiberglass. Cut wood doors with a reciprocating saw. Do not try to use the circular saw. The diamond blade will simply scorch the wood, barely cutting it, and a wood blade will grab the wood and take off, which will be dangerously hard to control. Available in a single flap version and a two flap version–one flap on the inside of the frame and one to the outside–with an approximate 1″ dead air space between them (see “Number Flaps”column). Both flaps have magnets to stand up to wind and a brush-type weather stripping between the magnets. As a result, the Hale pet door stands up to wind much better than other single flap pet doors will and the dead air space provides better insulation than a single flap pet door. Flaps Double flaps (one flap on each door surface) made of flexible 3/16” clear PVC vinyl. Inner Frame Inner frame made of two separate metal extrusions. Three sides entrap the security cover. Both metals are .063” wall thickness. Outer Frame Extruded 6063-T5 aluminum with .063” wall thickness. Designed to sleeve into the inside frame. Flange The outer frame flange is .070” smaller than the inner frame flange to allow the frame to sleeve together. Alnico5 Magnets A ¼” rod magnet 1 ½” long made from an aluminum, nickel and cobalt alloy known for its strength and durability. Door size determines number of magnets. Strikes Made of ferrous stainless steel. 1 ½” long, ¾” tall and 1/32” thick. U shaped with interior prongs, when squeezed onto the vinyl flap, the barbed prongs hold firmly. Weather stripping Flap is surrounded by ½” nylon pile for maximum insulation. Nylon is woven into a backing 9/32” wide and 1/32” thick. Security Cover 1/4” thick King Starboard® polymer sheet. Extremely shock and impact resistant. Has a 3/8” diameter locking hole. Cover Handle A lightweight zinc alloy cabinet knob pull type handle in a satin nickel finish that is 25/32” wide, 19/32” tall and 53/64” deep with a 1/2” deep and 21/32” wide finger hole. It is attached to the cover with a 12 mm long zinc coated steel flat head Philips screw with a .70 thread size that is countersunk to prevent scratching the frame. Pin Lock A ¼” diameter positive action steel pin encased with 5/32” thick fabricated plated steel. Gap Standard range between door frames is from 1 9/32” to 2”. A dimension larger than 2” would normally be considered a wall unit. Can be factory modified to collapse to as small as ¾” gap. Call our customer service if you need this change 800-826-2871. Raincap An optional awning like attachment that hooks to the outside frame for use in diverting water and preventing it from entering the pet door from above.